Livestock adapts well to relatively consistent cold or hot conditions. Production is affected when there is a repetition of abrupt temperature swings. Properly designed ventilation will moderate or eliminate the abrupt temperature swings offering the animal the sensation of cooling under hot conditions and warming under cold conditions. 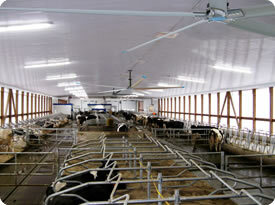 One of the great recent innovations in livestock ventilation is the very large (up to 24 FT diameter) HVLS ceiling fans. Sun-North’s sister company, Envira-North Systems manufactures the Altra-Air Sailfin series of ceiling fans. With some barn and livestock facilities, alleyways and resting areas are restrictive and the Absolute Air equipment can solve the ventilation needs of these conditions. 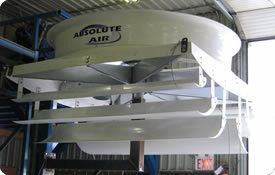 Absolute Air is belt driven and of fibreglass and aluminum construction. Absolute Air has high and low speed selectors and is able to move 80,000 cfm over an area of 600 sq. meters. It is complete with 6 adjustable air flow deflectors.